It is with great joy and prayer that we welcome you to enlist in the Army of Love. This ministry began with a vision given by the Holy Spirit to my wife Lynsi in 2013. Going through a difficult time in her life, she cried out to God and asked desperately to be used by him. In this time, she began seeing the body of Christ coming together in unity from all walks of life with diverse gifts and skills to help those who were in need, including herself. She then began to envision how to foster an atmosphere where believers are encouraged and equipped to use their gifts and talents, to become an Army of Love that ministers to a hurting and dark world. The gifts of God that dwell in the hearts of believers can often remain dormant, or even undiscovered. Thus, the vision of the Army of Love is to unite and equip the body of Christ to minister and bring healing to broken hearted and hurting people through Christ’s love and by the power of the Holy Spirit. This is done by fostering those God given gifts in believers so that they can minister with love and maturity. So, should you choose to accept this mission, we will embark on this great journey together; united in faith, calling, and purpose as we become better equipped to do the work of the ministry (Ephesians 4:12-13) and enjoy the fulfillment of all God has for his people to be saved, healed, set free, and equipped to do even greater things than He did (John 14:12); to be all we can be in Him! Thank you for your willingness, your time, and your heart to serve in the Lord’s Army of Love! Do you consider yourself a born-again Christian? If so, describe how and when you became a Christian. Please briefly describe your relationship with the Lord? Serve in an outreach ministry? 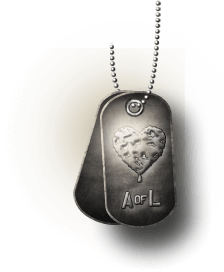 How did you find out about Army of Love, and what makes you want to serve as a volunteer? Do you know what your spiritual gifts are? If so, please describe them. What areas of your life do you struggle with most in your walk with the Lord? Have you had any education, discipleship or training in biblical faith? If so, please describe. Would you like to receive additional training in ministry tools? If so, in what area? How do you see your gifts and talents being utilized to support Army of Love’s mission? What is a realistic amount of time you could volunteer per week? Briefly describe where you want to be in your walk with the Lord 5 years from now.